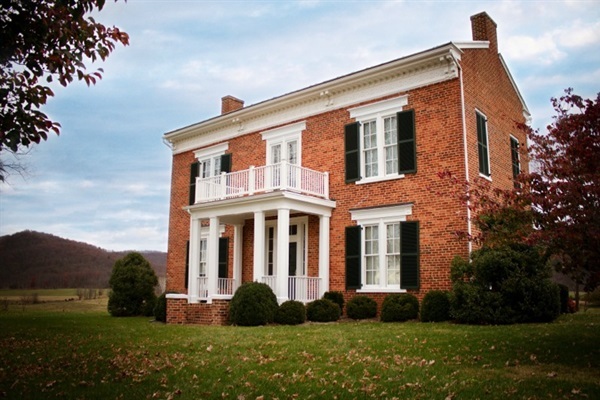 Joseph House is a fully restored Federal-style farmhouse built in 1845. Joseph House provides an elegant location for weddings, rehearsal dinners and any private event and makes ideal accommodations for a bridal party or family. The photo opportunities both inside and outside are superb. Joseph House has three bedrooms, a full modern kitchen, dining room, a parlor, a library, a magnificent staircase and an outside balcony over the front portico. There are gas fireplaces in every bedroom, the master bathroom and all common rooms. The grounds are well maintained and provide many options for photographs, ceremonies and dining. Events with more than 30 guests will require tenting. Shenandoah Woods is designed for tranquil vacations, our properties are not for loud groups. On the ground floor you will find the kitchen, dining room, parlor, library, powder room, a side porch that is partially covered and a back porch that is covered and screened. On the second floor are three bedrooms, three bathrooms and a laundry room. The master bedroom has a four-poster king bed. The master bath has a claw-foot tub but not a shower. The second bedroom has two queen beds and is served by the hall bathroom which has a combination tub/shower. The third bedroom is accessed by the back stairs and has a queen bed. This bedroom has a private bathroom with a shower and laundry room. Joseph House is ideal for events such as wedding ceremonies, rehearsal dinners and small receptions. Please inquire for event pricing.